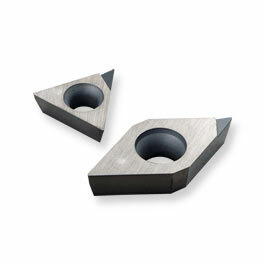 KPD001 Polycrystalline diamond (PCD) inserts for non-ferrous metals, non-metals, various applications that require sharp cutting and long tool life due to extreme hardness. Cutting edge strength, wear resistance, fracture resistance, good edge-sharpening performance and long, stable tool life. Ready to make a purchase? Kyocera Precision Tools are sold through authorized distributors throughout North America. Please click the Locate a Distributor link to find a location near you.